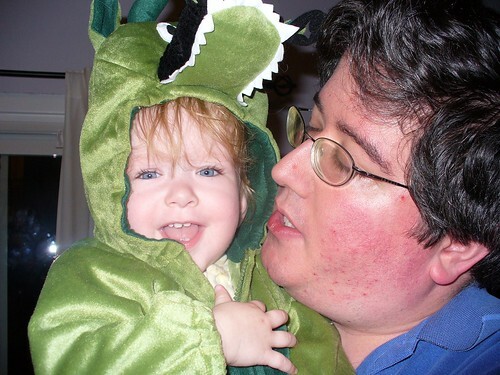 We were very fortunate that the dragon costume that we bought for little Vivian all these months ago still fits her. Another couple of weeks, and it would have been a different story. My mother-in-law and Erin took Vivian around the neighbourhood, where she was a popular visitor to more than a few front doors. I stayed behind to shell out. For Vivian, it was a delightful experience. Imagine: you walk up to people’s doors, and they hand you stuff! Devil Rosemarie and Dragon Vivian. Vivian with her haul (a coffee crisp). By the way, I’d like to know who the dim bulb was that coined the phrase “easy as taking candy from a baby”. It’s not easy, and it certainly isn’t quiet. 2004: A Compelling Canadian Political Thriller. Who'da Thunk It?